If you are not keen on bergenias, look away now! No one can deny that these are useful plants but not everyone loves their rather dumpy habit, leathery leaves and stout stems of pink flowers. The whole plant has a rather staid, plasticky look – and feel – and snails treat them as Travelodges. Yet, they are truly valuable as easy ground cover and to edge borders and there is more variety among them than most people think. The hosta has been called the ‘flowering foliage plant’ but the title could also apply to bergenias. The flowers are just the icing on the cake and it is really the leaves that we should appreciate and although most varieties are just (slight) variations on a theme, and the variegated choices (which I should adore) are a slight let down – especially the slightly miffy ‘Tubby Andrews’ – ‘Lunar Glow’ is very bright if you like pink and yellow! The best are those that have leaves that turn red in autumn and winter and I have already mentioned ‘Irish Crimson’ which has rather narrow leaves. A lot of those that colour well are derived from B. purpurascens. 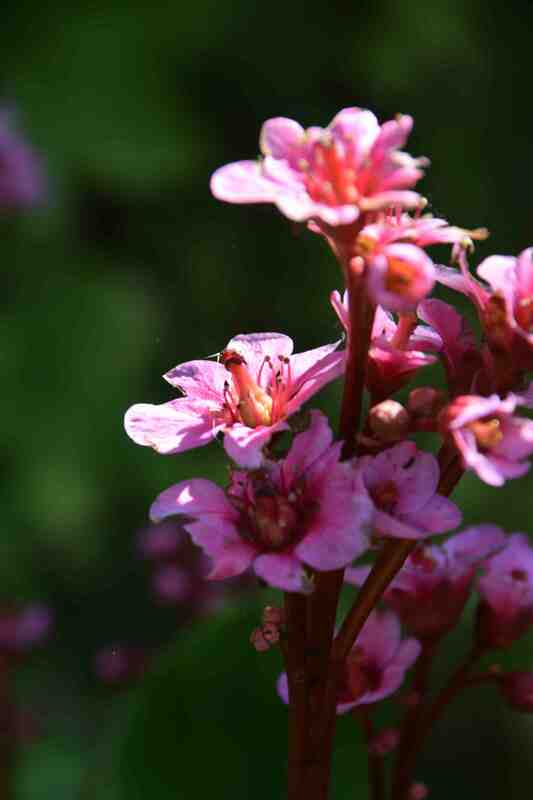 As a rule this is a slightly more delicate plant than most bergenia growers are prepared for and will not thrive in the dry, dark places in which B. cordifolia – and the offsets you have been given by people fed up with the plant – will grow. Bergenia purpurascens commits another fashion crime because the deep pink flowers veer on magenta, the ultimate faux pas to the horticultural cognoscenti. When these flowers burst forth among the common yellow colour scheme of spring the result is something that would have made an Edwardian lady reach for the smelling salts. So if bergenias divide gardeners do we need more? Well Terra Nova nurseries in Oregon, the people who have brought us so many exciting plants, have been breeding bergenias and their ‘Dragonfly’ series (which I have not seen yet) promise plants with dainty leaves and masses of flowers – an exciting development. 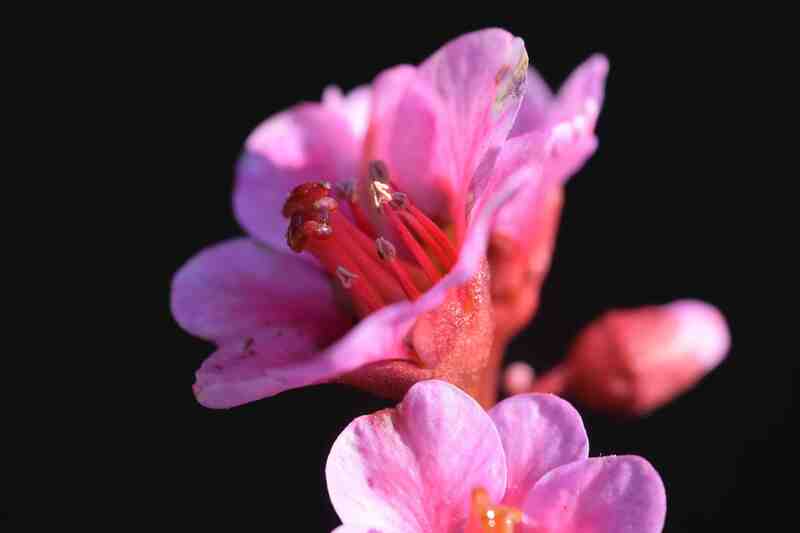 But do we need a bergenia that flowers in autumn? I picked up ‘Autumn Magic’ a few weeks ago at a local garden centre and have been enjoying – or enduring- its pink flowers ever since. I am not sure that bergenias are a big seller in garden centres so this seems an odd development in a way. But garden centres have to try hard to sell plants to customers, most of whom come in to buy pet food, coffee or Chinese tat. Summer is a dead season but autumn has potential for plant sales. When I first worked in a garden centre autumn was the main season for shrub sales but now it is bulbs and Christmas decorations that get people into the centres. And garden centres work hard to get us to buy plants to fill pots and baskets for autumn and winter. I enjoy planting autumn pots and the two options are to buy one of those ridiculously cheap, huge chrysanths covered in zillions of buds or to plant a collection of smaller plants. As well as pansies, small evergreen shrubs and wonderful, scented cyclamen, how good would it be to add a flowering bergenia. So I guess that ‘Autumn Magic’ has potential for autumn plant sales, attracting the average customer that flits from one patch of colour to the next like a huge, caffeine-fuelled butterfly. I can’t find out when ‘Autumn Magic’ was introduced but it seems to have been given an RHS AGM which is reassuring because my big concern with it is that whereas with most, the buds that form in autumn sit there to bloom in spring, I assume that with this one the buds do not need that winter chilling to develop and they open as soon as they are mature, in autumn. I am slightly worried that the spring display will be compromised. But there is a second string in this case and the leaves are supposed to turn rich crimson in winter – we will see. It is an interesting development and opens up some exciting planting associations: with liriopes, schizostylis, Japanese anemones and tricyrtis. I suppose at least you know where they are!